Healthy fast food? Yes, it’s possible! I love to cook something healthy & tasty…but my first preference is ” Healthy ” so today cut it down gluten and grains. Freshly grated cauliflower serves as the base for the creative and delicious crust that you can fold up just like traditional pizza! 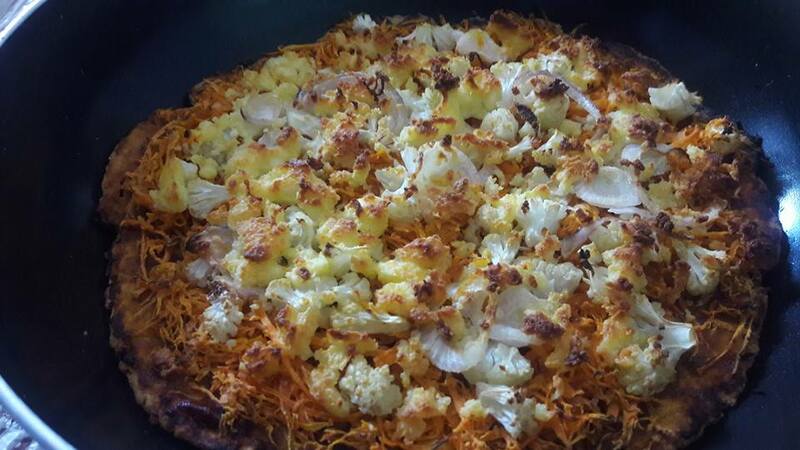 here it is delicious vegetable overload pizza recipe. Line a rimmed baking sheet with parchment paper, and preheat oven to 425ºF. 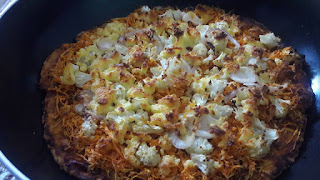 Grate the cauliflower using a box grater until you have two cups of cauliflower crumbles. Place in a large bowl and microwave for seven to eight minutes, or until soft. Remove from the microwave and let cool. pat into a 10-inch round on the prepared pizza pan. Spray lightly with nonstick spray or apply some oil and bake for 10 to 15 minutes, or until golden. Top the pizza with the sauce, 1/4 cup mozzarella, slice tomatoes, crushed garlic, and red pepper flakes. Bake in the oven until melted and bubbly, another 10 minutes. Top with basil / oregano before serving.